CX is a network exchange format, designed as a flexible structure for transmission of networks. It is designed for flexibility, modularity, and extensibility, and as a message payload in common REST protocols. It is not intended as an optimized format for use in applications or for storage. CX is "aspect-oriented", meaning that different types of information about network elements are separated into types of modules ("aspects"). Each aspect type specifies a schema for the information that it contains, typically a set of elements where the elements for that aspect type also have a defined schema. There are design guidelines for dependencies between aspects; the most basic guideline is that dependencies should be simple and minimal. The flexibility of CX enables straightforward strategies for lossless encoding of potentially any network. At the most basic level, this means that CX imposes very few restrictions: graphs can be cyclic or acyclic and edges are implicitly directed, but formats can choose annotations schemes to override this. CX does not, itself, make any commitment to a single “correct” model of biology or graphic markup scheme. CX is designed to facilitate streaming, potentially reducing memory footprint burden on applications processing large CX networks. In particular, in a CX stream, the elements of each aspect are broken into fragments and the fragments can be transmitted in any order. Conceptually, the network consists of three nodes, two of which are connected. The nodes aspect (named nodes) comprise the base aspect, while the edges (named edges) are an aspect composed onto the nodes, as are the cartesian coordinates (named cartesianLayout). The “CX Encoding” diagram shows all three aspects, focusing on how the edges and cartesianLayout annotate nodes. The “nodes” and “edges” contain no other information about the network, simply the identifiers of the nodes that the network contains and the edges that connect them. The elements of other aspects typically refer to nodes and edges by their IDs. Some aspects simply annotate the network as a whole. Any reference between aspects by ID is allowed but complex schemas of linked aspect elements are considered bad practice. Applications are free to make use of relevant aspects while ignoring others. Using a CX network is therefore a process of selection of the desired aspects followed by integration of the aspects in a task appropriate data structure. Aspects ignored by an application are referred to as "Opaque" to the application. Note that CX is not intended to be used as an internal data structure for an application, although some applications may choose to use it this way. Aspects are sets of Aspect Elements, each of the same type. The Aspect defines the data structure for its elements and can hold multiple instances of that data structure. An Aspect essentially amounts to a data type, defining the distinct key values and structure for its elements. An aspect defined by a community may evolve over time, requiring versioning. This is handled simply by defining a new aspect name. The name can include the version, but specifying the aspect version in pre-metadata would be the preferred method. A program supporting CX must therefore know which aspects it handles by name and version(s). An Aspect may define an “@id” property for its elements. This is the id by which the element may be referenced by another element, either in the same aspect or in another aspect. Referenceable IDs defined in an aspect must be unique for the aspect for the life of the network. All Aspects must define the schema for their elements such that any references to elements are typed: it must explicitly define the Aspect of the referenced element. For example, if an Aspect can refer to both nodes and edges by their ids, it must use different keys to do so, otherwise the references would be ambiguous. Note that this typing enables placeholder objects to be created by applications reading CX when they encounter a reference to an element before the element itself while processing the CX stream, updating the placeholder as the full information becomes available. Aspect Element ids are integers and are assigned based on a monotonically increasing counter stored in the Aspect Metadata. References between Aspect Elements pose challenges in the case where a program changes a CX network while treating some aspects as opaque. References between modified or deleted elements and elements in the opaque aspects may become inconsistent. For this reason, each application that modifies a CX network should designate the Aspects that it asserts to be consistent after the modifications, using the Aspect Consistency Group metadata (see below). Note that streaming filters can easily be implemented if the operate on Aspects with elements that aren’t referenced by other elements - elements can be removed incrementally without introducing inconsistencies. But in the case where the elements may be referenced by other elements, the participating Aspects must be loaded into memory to resolve inconsistencies before transmitting the filtered CX. Note that in a given CX stream of Aspect Fragments, it is not necessary that a referenced element be defined before its reference. References will typically be resolved after the CX stream is parsed, but note that it is not required that the recipient resolve any references unless this is necessary for its function. A program might pass resolve reference only for aspects that it used and simply pass on or ignore all other aspects. Best practice for a program that stores networks based on CX is that it should resolve all references between supported aspects and should error if there are any references that cannot be resolved, that leave incomplete “placeholder” elements. A number contains an integer component that may be prefixed with an optional minus sign, which may be followed by a fraction part and/or an exponent part. Numeric values that cannot be represented as sequences of digits (such as Infinity and NaN) are not permitted (in contrast, for numerical value attributes, such as nodeAttributes, which are serialized as strings within quotations, "NaN" and "null" are permitted). The storage of these numbers for a given application parsing CX depends on the JSON implementation used. NDEx and the Cytoscape ecosystem support integers up to 4 bytes, ranging from -9,223,372,036,854,775,808 to 9,223,372,036,854,775,807. Any use of integers should be limited to this range. An aspect may also be designed to store numbers as strings, placing the responsibility for parsing and otherwise handling these values on any CX implementations that supports the aspect. First, an optional pre-metadata object is transmitted, followed by a sequence of aspect fragments and then by an optional post-metadata object. A status aspect is transmitted at the end. The primary CX will be rendered as a sequence of Aspect Fragments, where each Aspect Fragment holds one or more Aspect Elements. The Aspect Elements contained in all fragments of a given type compose the Aspect. Structuring a CX network as a stream of Aspect Fragments addresses the design goal to enable incremental processing of CX, promoting the development of network processing services that are memory efficient and potentially parallelizable. There is no fixed limit on the number of elements an Aspect Fragment can contain, though the number should be “small” -- less than 100 is safe. The larger the Aspect Fragment, the less likely the sender or receiver may have the memory necessary to represent it. The “error” field holds the error message when error occurs. “success” fields tells if the cx document is successfully generated by the source. As a transfer format, Aspect Metadata is understood in the context of a network owner and a consumer, where the consumer may modify the network and return it to the owner. The owner is considered to have a complete picture of the network including all metadata and aspects associated with the network, and is considered to be authoritative as to the entire network and its parts. While the consumer can ask the owner for all or some of a network’s aspects, for every aspect returned by the owner, the owner must also return the aspect’s metadata. Additionally, for every aspect the consumer sends to the owner, it must supply the aspect’s metadata. The owner or consumer can send part of each aspect’s metadata as pre-metadata and part as post-metadata -- the aspect’s metadata is considered to be the union of the pre-metadata and post-metadata. Each aspect must have pre-metadata containing at least a name and version field. If an aspect has post-metadata, it must have the same name field as the corresponding pre-metadata. For optional elements, the sender must include the element values, but is not required to if it doesn’t have values for these elements. For optional and required fields (besides name and version), the sender is free to send each field as pre- or post-metadata, the choice of which is solely the sender’s convenience. The receiver must be prepared to accept metadata values as pre-metadata, post-metadata, or (for optional fields) not at all. Besides name, all attributes should only be specified at most one time -- there should be no redundant attributes stated in both pre-metadata and post-metadata. The union of pre-metadata and post-metadata must always be equivalent to the aspect metadata - for example, it is valid for a system to receive CX, merge pre and post metadata and then output CX with all attributes specified as only pre-metadata. Each aspect may pose its own requirements on which additional attributes are mandatory in the corresponding metadata. When a sender has the choice of sending an element as either pre- or post-metadata, all things being equal, it should send it as pre-metadata. properties:   list of name value pairs in JSON object format. When an application modifies a CX network, it may make changes that are inconsistent with the state of aspects that it treated as opaque. Subsequent operations may need to know which aspects are expected to be consistent with each other and which may be inconsistent. To that end, we define “consistency groups” and in the metadata for each aspect, a consistencyGroup attribute assigns the aspect to one group. All aspects in a group are asserted to be consistent with each other. An application that modifies a CX network should therefore set the consistency group assignments for the aspects that it changed, added, or can prove to be consistent such that they are distinguished from those that may have become inconsistent. A simple case is where an aspect is added that only refers to nodes and/or edges. It should be assigned the same consistency group as the nodes and edges. But, for example, in the case where edges are deleted, the application should also check consistency and potentially edit all non-opaque aspects to ensure that they have no references to deleted edges. All of the modified and checked aspects are assigned a new, unique consistencyGroup attribute. All opaque aspects retain their previous consistencyGroup and can be identified as potentially inconsistent with the nodes, edges, and other aspects. The consistencyGroup attribute is a monotonically increasing value that increments when a change occurs that could make one or more aspects inconsistent. When we add an aspect, it gets tagged with the current consistency group (assuming it's consistent with other aspects). When we update an aspect, we increment the consistency group and tag the updated aspect(s) with it. Aspects in the same consistencyGroup are consistent with each other while aspects in different groups may potentially reference elements that no longer exist or can in other ways be inconsistent. Nodes are represented as (possibly multiple) lists of node key-value pairs, preceded by the keyword “nodes”. For nodes the keys are “@id” and the values are the node identifier strings that parse as integers - “node ids”. Optionally, nodes can have a name (a single string), specified by the "n" key. Nodes can also have an optional represents attribute ( a single string), specified by the “r” key. All node ids must be unique in the node aspect. A CX writer should not emit a node aspect in which node ids are repeated and it is good practice for any CX reader to test for uniqueness and handle malformed node aspects (either by erroring or by repairing, as appropriate to the application). Condition is that all node ids (as a matter of fact, this applies to all other aspects with ids) are unique (and not “empty”). At this point, it is the responsibility of the writer to make sure this is true, but we could easily add a check for uniqueness to our parser. Edges are represented as (possibly multiple) lists of dictionaries, preceded by the keyword “edges”. Edge dictionaries have three keys: “source” and “target” which refer to the node identifiers connected by the edge and, and an identifier which is used by other elements to refer to the edge (the “edge id”). All edge ids must be unique in the edge aspect. A CX writer should not emit an edge aspect in which edge ids are repeated and it is good practice for any CX reader to test for uniqueness and handle malformed edge aspects (either by erroring or by repairing, as appropriate to the application). Although a given CX network might not have any aspects that reference edges, the identifiers are always assigned for consistency and to simplify subsequent operations on the network. Nodes can optionally also have a interaction field, specified by the "i" key. The aspect metadata must contain an idCounter representing the highest @id contained in the aspect or any previous version of the aspect. “po” - property of specifies the node to which the attribute applies. Cytoscape supports this aspect for both CX input and output. The edgeAttributes are mapped to the Cytoscape edge table for a network. NDEx supports this aspect, storing it in a manner that enables queries to networks based on edge attributes. “po” - property of specifies the edge to which the attribute applies. "v": "Node 5 (undirected) Node 6"
"v": "Result of heat diffusion analysis"
Cartesian layout elements store coordinates of nodes. Usage: Cytoscape supports this aspect for both CX input and output. Format is not controlled but best practice is to use string conforming to Semantic Versioning. used by NDEx to indicate format of an original file imported, can determine semantics as well. The NDEx UI will allow export options based on this value. Applications that alter a network such that it can no longer be exported in the format should remove the value. This aspect is deprecated. Starting from v2.4.0, NDEx server will no longer generate this aspect from the server side. Network last updated before the v2.4.0 release will still have this aspect. Users can use the ‘Get Network Summary’ API function to get the status and other information of a network. "ndexStatus" is NOT the same as the "status" aspect. The ndexStatus aspect contains attributes that describe the state of the network when it was last stored in NDEx. “externalId” - string - the CX network was derived from an NDEx network with this universally unique identifier (UUID) . The CX network may be a complete rendition of all the information that was stored on NDEx or it may be some subset of the network. “creationTme” - timeStamp (string) - Time at which the network was created. “readOnly” - boolean - Content modification not permitted only if true. “visibility” - string - One of PUBLIC, PRIVATE. PUBLIC means it can be found or read by anyone, including anonymous users. PRIVATE is the default, means that it can only be found or read by users according to their permissions. “published” - boolean - (planned for Q4 2017) If true, network is permanently readOnly but access privileges can be altered. “edgeCount” - integer - the number of edge objects in the network. “owner” - text - unique name of owner on the server. “ndexServerURI” - URI identifying the NDEx server from which the network retrieved. This aspect is deprecated. We recommend using the attribute ‘citation’ on edges or nodes to store citations. The citations aspect elements specify literature references or other sources of information that are relevant to the network. Other aspects, such as supports, edgeCitations, or nodeCitations can link them to specific nodes and edges in the network, indicating that the citation supports the assertion represented by the given node or edge. Citations are primarily described by five dublin core terms. The “dc” prefix is implicitly interpreted as referencing dublin core in the context of the citations aspect. Ideally citations make use of the “identifier” key to link to their source. This can be a URI, but might also use the “source:id” format, where source is usually “pmid” or “doi”. This should be a description of the resource, and it is preferable that information that can be expressed in more specific attributes should not be in this attribute. The “description” attribute could contain the title, authors, and/or journal reference, but in that case it would not be expected to be machine parsable. Additional attributes can be added to the citation using the “attributes” attribute, a collection of name-value pairs. "dc:title": "Bcl-2 functions in an antioxidant pathway"
This aspect is deprecated. We recommend using the the attribute ‘citation’ on edges or nodes to store citations. Each nodeCitations element links a collection of node ids to a collection of citation ids. Each edgeCitations element links collection of edge ids to a collection of citation ids. This aspect is deprecated. We recommend using the the attribute ‘support’ on edges or nodes to store citations. Each support element defines text that can be used to “support” - i.e. provide evidence for - one or more nodes or edges in the network. It optionally can also specify a citation id to indicate that the text is derived from the cited publication or data source. It may also have an optional attribute “attributes” which is a collection of name-value pairs. Each edgeSupports element links a collection of edge ids to a collection of support ids. Each nodeSupports element links a collection of node ids to a collection of support ids. This aspect is deprecated. No recommendations for alternative representation. functionTerms aspect elements link nodes with expressions that define the meaning of the node in the network. The expressions compose external vocabulary terms to define concepts. Examples in BEL would include expressions that define complexes, reactions, protein activities and which distinguish proteins vs RNA vs genes. “po” - an id - specifies the node which the function term defines. “f” - string - the function, a name or an external vocabulary term specifying the composing function. “args” - list of strings - ordered argument list to the function. Each argument can be either a literal value (string or number), an external vocabulary term, or a functionTerms expression. A reifiedEdges Aspect Element designates that a node represents an edge. This is used to implement logic such as “A increases the inhibition of C by B” where the target of the “increases” edge is intended to be another edge, the “inhibits” edge from B to C.
The reifiedEdges aspect enables representation of this case by designating an additional node “D” to represent “B inhibits C”. The CX edges attribute can then be populated with “A increases D” and “B inhibits C”, a simple topology that should be handled by any network application. 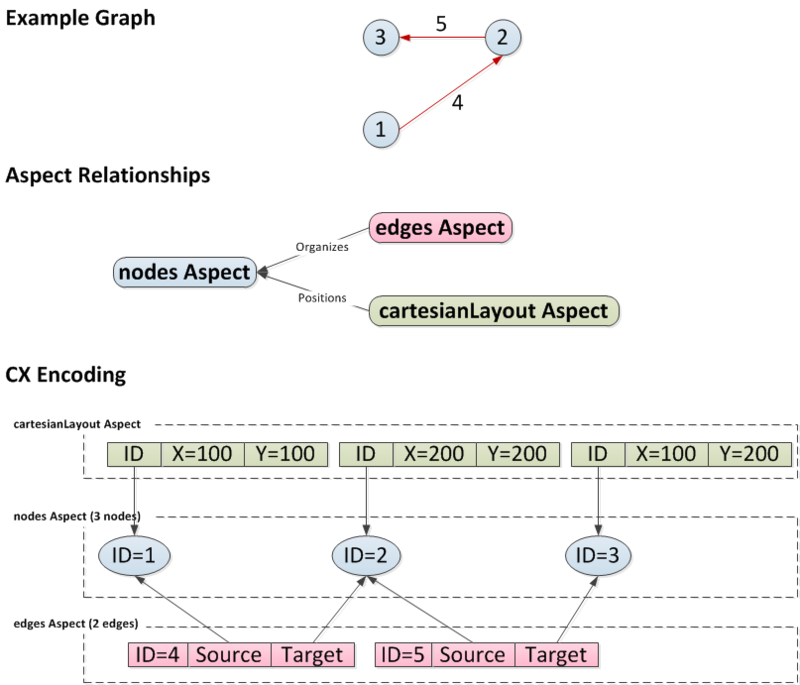 Applications that have internal data models supporting edge-edge interactions can parse the reifiedEdges aspect to determine which nodes are “standing in” for edges. Cytoscape treats this aspect as opaque. NDEx supports this aspect, storing it in a manner that enables queries that retrieve subnetworks to include the reifiedEdges elements and edges that apply to the selected nodes. “edge” - an edge id - specifies the edge represented by the node. The @context was a separate aspect in the previous release of CX specification. It is inspired by the JSON-LD @context structures that define the vocabularies used in the CX document or stream. In order to make it easier for user to user and make it more compatible with Cytoscape network data model. We have change @context from a separate aspect to an attribute on the network. The value of this attribute is a serialized string from a JSON dictionary that has a prefix as its key and a URL as its value. @context maps terms to IRIs. Terms are case sensitive. This is a valuable feature of CX because it enables unambiguous, consistent reference to controlled vocabularies, when referencing both properties and values. It is possible to determine all namespaces and specific terms used in a network in a consistent fashion. This aspect is deprecated. The server will just treat this as an opaque aspect. Client applications can still use it but should not expect a CX document to always have this aspect. For recording the origin and significant events of this network, we recommend to use network attributes to store them. We recommend using prov:wasGeneratedBy and prov:wasDerivedFrom for the event and the list of contributing network URLs. Cytoscape contributes aspects that organize subnetworks, attribute tables, and visual attributes for use by its own layout and analysis tools. This section describes the Cytoscape aspects, which are distinguished by the “cy” prefix on the aspect name. collapsed: a boolean value to indicate whether the group is displayed as a single node. "v" : "Prefuse Force Directed Layout"
edges: the edges making up this subnetwork - list of edge identifiers, can be "all"
nodes: the nodes making up this subnetwork - list of node identifiers, can be "all"
applies_to: indicates whether this applies to "node_table", "edge_table", or "network_table"